“These results show ancient Venus may have been a very different place than it is today,” siad Michael Way, a researcher at NASA’s Goddard Institute for Space Studies (GISS) in New York. Venus today is a hellish world. It has a crushing carbon dioxide atmosphere 90 times as thick as Earth’s. There is almost no water vapor. Temperatures reach 864 degrees Fahrenheit (462 degrees Celsius) at its surface. 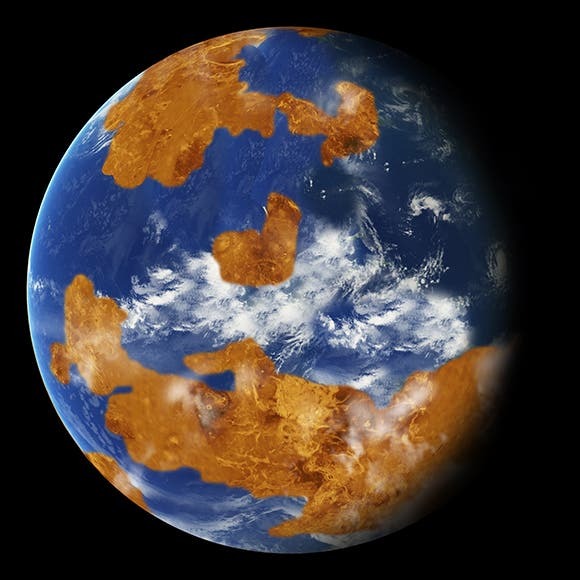 Venus may have had a shallow liquid-water ocean and habitable surface temperatures for up to 2 billion years of its early history, according to computer modeling of the planet’s ancient climate by scientists at NASA’s Goddard Institute for Space Studies (GISS) in New York. The findings, published in the journal Geophysical Research Letters, were obtained with a model similar to the type used to predict future climate change on Earth. “Many of the same tools we use to model climate change on Earth can be adapted to study climates on other planets, both past and present,” said Michael Way, a researcher at GISS and the paper’s lead author. The research was done as part of NASA’s Planetary Science Astrobiology program through the Nexus for Exoplanet System Science (NExSS) program, which seeks to search for life on planets orbiting other stars, or exoplanets, by combining insights from the fields of astrophysics, planetary science, heliophysics, and Earth science. With no water left on the surface, carbon dioxide built up in the atmosphere, leading to a so-called runaway greenhouse effect that created present conditions. Previous studies have shown that how fast a planet spins on its axis affects whether it has a habitable climate. A day on Venus is 117 Earth days. Until recently, it was assumed that a thick atmosphere like that of modern Venus was required for the planet to have today’s slow rotation rate. However, newer research has shown that a thin atmosphere like that of modern Earth could have produced the same result. That means an ancient Venus with an Earth-like atmosphere could have had the same rotation rate it has today. This type of surface appears ideal for making a planet habitable; there seems to have been enough water to support abundant life, with sufficient land to reduce the planet’s sensitivity to changes from incoming sunlight. Way and his GISS colleagues simulated conditions of a hypothetical early Venus with an atmosphere similar to Earth’s, a day as long as Venus’ current day, and a shallow ocean consistent with early data from the Pioneer spacecraft.